Waldo Rochow, MBA: Do You Feel The Heat Yet? I'm sure that such tactics do not fool anyone who has taken a Home Economics course in school. But what about the people who haven't? This kind of tactic is preying on the segment of the population that need value the most. The other day as a treat for my son, I took him to McDonald's for lunch. I don't remember the last time I ate anything from that particular fast food chain, so imagine my surprise at how small the "Big" Mac is now. When I mentioned it to my wife she said, "Yeah, they've been getting smaller for a while." It reminds me of a story I heard many years ago. If you want to cook a frog, you have to do so slowly or it will become rubbery. (I don't know why anyone would want to eat a frog, it's just an illustration.) 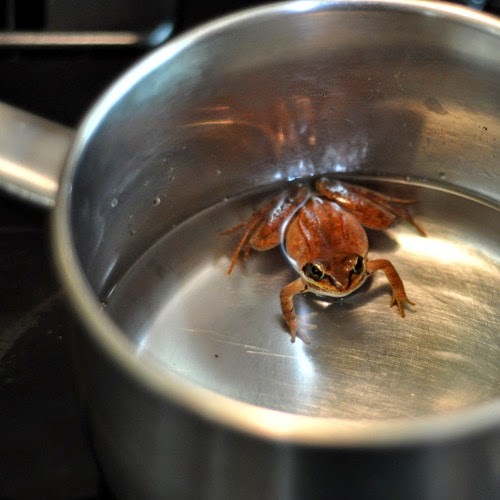 To maintain the perfect texture, apparently you put the frog into a pot of cold water and then, ever so gradually, turn up the heat. The frog will get cooked without even noticing that it is taking place. Now I have long since maintained that one has to be vigilant when shopping. But this, in my opinion, is another question of corporate ethics, and #EthicalDebt. I used to hold Maple Leaf Foods in pretty high regard. Now that they are pulling this stunt, I will scrutinize all of their products much more closely. It won't take too many more incidents like this before that brand is forever tarnished in my eyes. I would be interested in hearing your thoughts. Is this practice dishonest, or is it justified? Which would be more likely to cause you stop buying your favourite brands: 1) a gradual increase in price, 2) a gradual reduction in package size?